As the subtitle makes clear, this densely written book compares four wars, starting with World War II, and attempts to explain why the "strategic architecture," the author's term for the combination of policy, strategy, and operations, was successful in the first but failed in the next three. 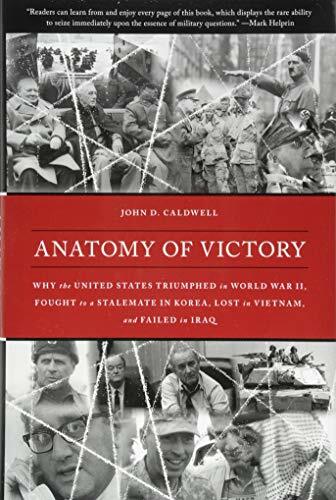 In fact, Anatomy of Victory tells much more about tactical history than about strategy. For each war, author John D. Caldwell offers a sequence of several separate chapters on specific military operations, then concludes with a fairly brief chapter summing up that war's strategic nature. His accounts of battles are minutely detailed and clearly if not compellingly written. His analyses, frequently marred by faulty logic and inaccurate or incomplete historical understanding, are less satisfying. A particularly notable piece of bad history is in his explanation of the origins of the Vietnam war and the competing ideologies in that conflict. In his very first page on Vietnam, Caldwell wrongly says that "As it did in Korea, the Cold War left Vietnam divided." In fact, the events leading to the division of Vietnam were in no way parallel to those in Korea. The first Indochina war in 1946–1954 was not a product of the Cold War but a revolution against French colonial rule, part of a broader post-World War II struggle against European colonialism in Asia. Inexplicably, Caldwell omits that fundamental fact. After misreading that earlier history, he continues to ignore the role of nationalism in the "new" conflict which he—also wrongly—says was "triggered" by the 1954 Geneva Accords that ended the first war. What led to the new conflict was not the agreement, but the refusal of South Vietnam and its U.S. ally to carry it out. Independence and national pride were powerful elements of the Communist message all through the U.S. war, while the Saigon regime, whose senior military commanders (and every top government leader from 1963 on) had all fought on the French side, was widely viewed, even by many strongly anti-Communist Vietnamese, as subservient to a foreign power. Nationalism was not the only issue in the contest for popular support. But it was a significant factor, and leaving it out entirely misrepresents the circumstances and nature of the war. Caldwell, a long-time analyst for think tanks and defense-related corporations, makes some valid arguments in his assessments of "strategic architecture." One useful example is his point that in both Vietnam and Iraq, corruption and ineffective governance by U.S. partners—issues often overlooked by battlefield-oriented American military officers—were critical factors in preventing military success in those wars. But there is muddy reasoning in those analytical chapters, too. A case in point is his discussion of World War II in Europe. Certainly, the Allies won an unqualified victory. But was their strategic achievement really "a benchmark for a victorious national commitment," as Caldwell calls it? The strategic turning point that sealed Germany's defeat was not something the Allies did, but Adolf Hitler's decision to invade the Soviet Union and open a new war. So, did the Allies defeat Nazi Germany because their strategy was correct? Or did Germany lose because of Hitler's catastrophic mistake? Winning a war because you made the right choices is not the same as winning because your enemy made the wrong ones. That is surely a relevant distinction when it comes to evaluating strategy, but one Caldwell does not clearly address. "Iraqi and coalition forces had conducted 142 battalion-level joint operations. They had detained 6,702 suspects, killed 1,196 insurgents, wounded 419 others, and killed or captured 382 high-level targets. Additionally, they found and neutralized more than two thousand IEDs and VBIEDs [vehicle-borne IEDs] and discovered 1,113 weapons caches." Caldwell cites those statistics in support of a broadly positive evaluation of the surge campaign. But to know what they actually meant, one would need some other numbers: How many of the 1,600-plus killed and wounded were truly enemy fighters? Were any of them civilians? How many of the 6,702 detained suspects were swept up in invasive home searches that terrorized their families? How were they treated in detention? To decide if that U.S. operation helped win Iraqis away from the insurgency or drove more toward it, those questions would need to be answered. But if Caldwell ever considered them, it is not evident. Asking why America's wars since 1945 have not been more successful, despite this country's vast wealth and technological resources, is a timely and meaningful question. Unfortunately, Caldwell's answers are less useful than they might have been with a better sense of history and more soundly logical analysis. Readers who have a consuming interest in the details of past battles will find plenty of material in Anatomy of Victory. Those more interested in the forest than the trees would be better served elsewhere. Arnold R. Isaacs spent nine years as a foreign correspondent for the Baltimore Sun, reporting from more than 40 countries. Among other overseas assignments, he covered the final years of the Vietnam war. Following his newspaper career, he traveled widely as an educator and international journalism trainer. He is the author of Without Honor: Defeat in Vietnam and Cambodia; Vietnam Shadows: The War, Its Ghosts, and Its Legacy; and an online report, "From Troubled Lands: Listening to Pakistani Americans and Afghan Americans in Post-9/11 America."